Yay, bacon! But also, no. Normally when anyone mentions the word bacon, our ears and tummies perk up like it’s meat Christmas. But cooking bacon in a toaster with some kind of foil and absorbent pad situation? No thank you, not for a kazillion dollars. Throughout food history there have inevitably been food flops, and Reddi-Bacon is just one of those destined to go down as a bona fide grody idea. Over at Neatorama they’ve got a fun lineup of other failed food ideas, and we’ve pulled together a few of our favorites. Or is that, least favorites? In any case, it’s no wonder these concoctions failed. 1. 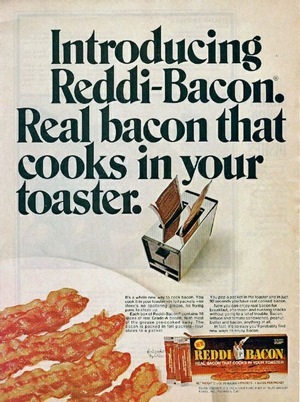 Reddi-Bacon: The minds behind delicious Redd-wip were probably ready (pun intended) to expand their popularity in any way they could in the 1970s. But popping foil-wrapped bacon into a toaster proved to be a likely fire-hazard, not to mention a great way to greasify your toaster and render it useless for making anything else. This one didn’t even make it nationwide before it was permanently shelved. 2. Do you like dessert? Do you like coffee? Why not combine them? Because coffee-flavored Jell-O sounds disgusting, that’s why. The company tried to combine these post-dinner treats but soon realized liquids and wiggly desserts should be kept separate. That didn’t prevent Jell-O from giving cola, celery and chocolate flavors a try later anyway. 3. One thing that is perfect just as it is? Delicious, crispy, golden French fries. So when Ore-Ida tried to appeal to kids in 2002 with chocolate, cinnamon and blue “Funky Fries,” it flopped after only a year. Too much funk can be a bad thing. 4. There’s nothing quite like being reminded that you are dining alone, at home, single as can be. Toss that desolate feeling together with baby food for adults and it’s no wonder Gerber Singles were a horrible, awful, soul-crushing idea. The company tried offering pureed meals out of a jar in 1974 but soon found adults don’t want to be considered infants just because they’re alone. So alone. Check out the rest of the flops at the source link below.